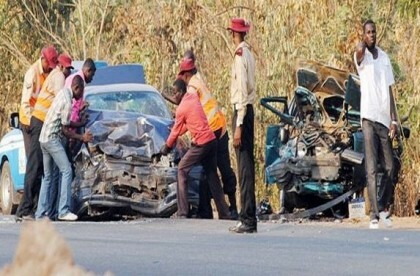 The Federal Road Safety Corps (FRSC) has blamed overspeeding for 60% of auto crashes experienced in Nigeria today. A crash scene. Image credit: NTA. This was revealed by the Corps Marshal and Chief Executive, Federal Road Safety Corps (FRSC), Dr Boboye Oyeyemi, on Sunday at a thanksgiving service to mark the 4th United Nations Global Road Safety Week at the Church of Christ in Nations (COCIN) in Gigiriing, Jos, Plateau. Oyeyemi represented by Mr Oludare Fadogba, the Zonal Commanding Officer, Jos Zone, said overspeeding has remained the prevalent cause of road accidents. He said the chances of crashing is higher when a driver is overspeeding than when he is driving within the recommended speed limit. Fadogba said; “Speeding is one of the most prevalent causes of road collision and attendant fatalities in Nigeria and even globally. The risk of crashes occurring is greater as speeding gets higher. Statistics shows that speeding and the involvement of commercial vehicles consistently account for about 60 per cent of road traffic crashes in Nigeria. This is why the Federal Government has to endorse the implementation of the mandatory installation of the speed limit device on commercial vehicles to curtail accidents, “he said.